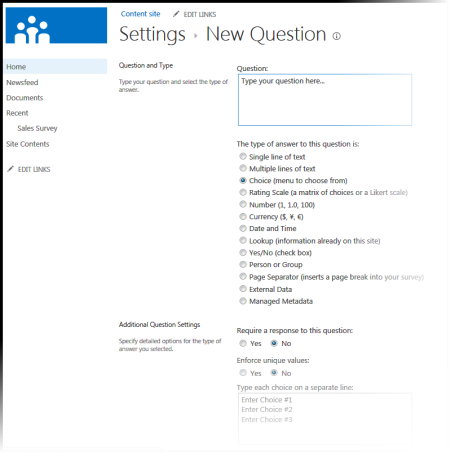 When you plan and create a SharePoint survey, you're making a special kind of list that enables the owner to create questions, have multiple people respond, and see a summary of the results. To learn how to respond to and edit survey answers, see Respond to a survey. Note: To create a survey, you must have permission to create lists on the site. An alternative is to create your survey in Excel Web App, where results are compiled in an Excel spreadsheet rather than a SharePoint list. Updated January 25, 2017 thanks to customer feedback. Note: Survey is a standard SharePoint app, and should be available across versions. If it's not a choice under apps, check with your administrator. Sign in to Office 365 with your work or school account. In the top of the page, select the app launcher icon and then select the SharePoint tile. Go to the site where you want to create the survey. Click Settings , and then click Add an app. look for and click the Survey icon. Note: You may have a choice of internal or third-party survey apps, if your company allows them. Talk to your SharePoint administrator for advice on which to use. You can also just enter a name, click Create, and then change settings and add questions later. Note: If you are using SharePoint Online, but your screens look different, your administrator you may be in Classic experience. Follow steps under the SharePoint 2016 tab instead. Type a name for the survey. Type a description of the survey in the Description box. The description is optional. In the Survey Options section, specify whether you want people's names to appear with their responses and whether people can respond more than once to the survey. On the New Question page, enter your question text and then select the type of answer that you want in the Question and Type section for your first question. Note: There currently is no automatic way to number questions for display, as you can't add additional columns to a Survey. If you want your questions number, put the number into the Question Name. Questions are added sequentially when you created them, however you can change the order of the questions from the settings page. In the Additional Question Settings section, you can specify whether an answer to the question is required, or people can respond more than once to the survey. Depending on the type of question, you can also enter answers to choose from and set a default value. If you want to add branching logic where the survey asks different questions based on what the last answer was, you need to finish creating the survey first. You can then go to the Survey Settings page and add branching logic. See Add branching logic to a survey for more info. In the Column Validation section, if you want to check whether an answer is valid, enter the formula you want to use for validation in the Formula box. In the User Message box, describe what the user needs to do to ensure the answer is valid. For example, if you’re asking an employee to enter the amount of time she’s worked in a department, you can specify that it could not be longer than the total time she’s worked for the company. 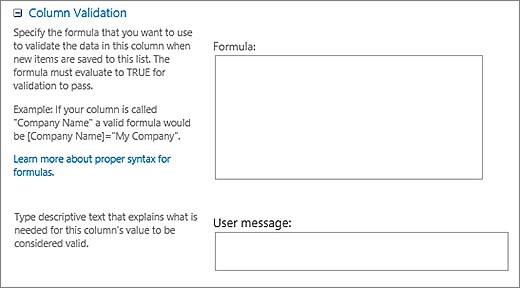 For more info on formulas, see Examples of common formulas in SharePoint Lists. To create additional questions, click Next Question, and then enter information for the next question. Continue the process until you add all the questions that you want. If you are finished adding questions, click Finish. 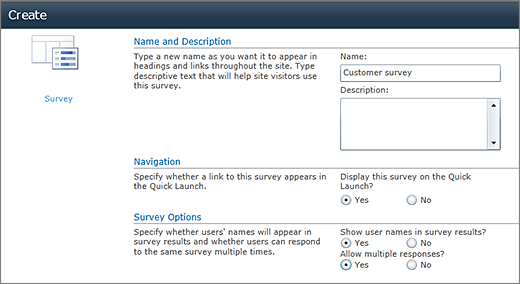 To see your survey, click the survey's name under Recent in the Quick Launch bar. 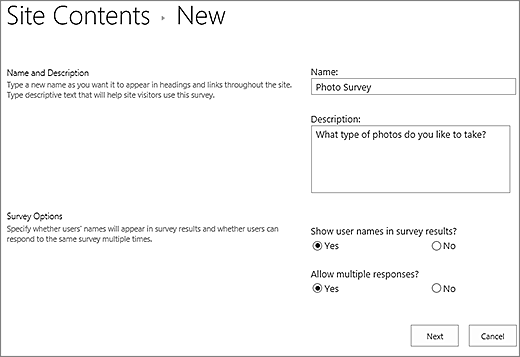 In SharePoint, navigate to the site where you want to add the survey. 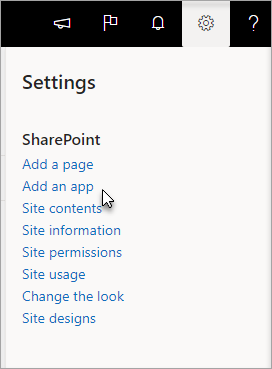 In SharePoint, click Settings , and then click Add an app. Note: There currently is no way to number questions for display, as you can't add additional columns to a Survey. If you want your questions number, put the number into the Question Name. Questions are added sequentially when you created them, however you can change the order of the questions from the settings page. 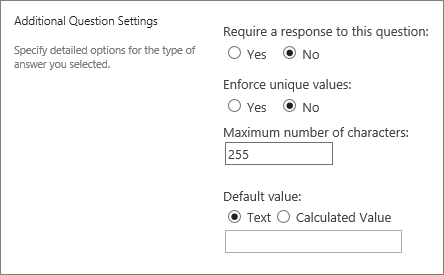 In the Additional Question Settings section, specify additional settings for your question, such as whether an answer to the question is required. Depending on the type of question, you can also enter answers to choose from and an optional default value. If you want to add branching logic, that is the survey asks different questions based on what the last answer was, you'll need to finish creating the survey first. You can then go to the Survey Settings page and add branching logic. See Add branching logic to a survey for more info. Note: To create a survey, you must have permission to create lists on the site where you are creating the survey. Navigate to the site where you want to add a survey. Click Site Actions , and then click View All Site Content. On the All Site Content page, and then at the top left of the page, click Create. Under Data, type "survey" into the Search Installed Items search box in the upper left of the screen, and then press Enter. Find and click the Survey icon. In the Name box, type a name for the survey. The name is required and appears at the top of the survey page. The name also becomes part of the web address for the survey page, and it appears in navigational elements that help users to find and open the survey. Click More Options to enter a description and to specify navigation and survey options. In the Description box, type a description of the survey. The description is optional. To add a link to this list on the Quick Launch, click Yes in the Navigation section. Tip: You can add or change questions later, if needed. 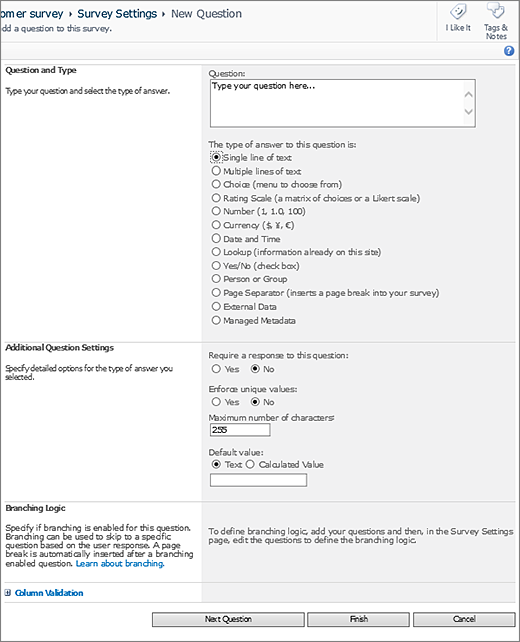 When you return to the Survey Settings page, if you don't see your survey on the Quick Launch bar on the left of the page, and would like to follow these steps. Click Title, description, and navigation. Click Yes under Display this survey on the Quick Launch. You can also change the name, add a description, show user names in results, and allow multiple responses here if you'd like. To see your survey, click its name in the breadcrumb navigation at the top of the page, or on the Quick Launch bar on the left. If you want the data from the survey to be available for offline viewing or analysis in Office clients, click Settings, and then click Survey Settings. Click Advanced Settings, and then in the Office Client Availability section, select Yes. Click View All Site Content, and then click Create on the All Site Content page. Tip: In most cases, you can use the Site Actions menu instead to complete this step. In the Name box, type a name for the survey. The name is required. The name appears at the top of the survey page. The name becomes part of the Web address for the survey page, and it appears in navigational elements that help users to find and open the survey. To see your survey, click its name in the breadcrumb navigation at the top of the page. Navigate to the survey that you want to change question order. Click Settings in the header of the survey, and then click Survey Settings. In the Settings dialog, scroll down to the bottom of the page and click Change the order of the questions. 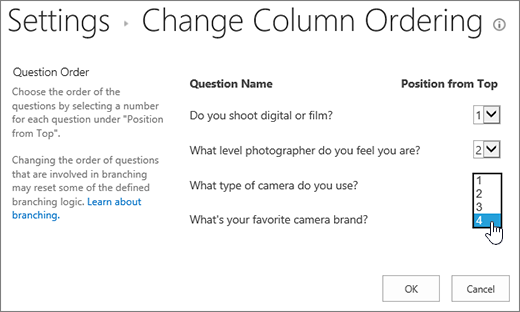 In the Change Column Ordering dialog, change the numbers under Position from Top to put the questions in the order you want. Click OK, and then click the survey name under the Quick Launch bar or in the breadcrumbs. If you want to reuse a survey but remove older responses, use the Site Manager to clear the data without losing the questions. A SharePoint survey is part of your site, so anyone with that can see lists and libraries will be able to see the survey. Your users must have contribute permissions to be able to respond to the survey. For more info on permissions, see Edit permissions for a list or library. You can put the survey on your home page by inserting it as an App Part. For more info, see Add an App Part to a page. To send a link to the Survey by email or IM, select and copy the URL from the browser's address bar, and paste it into your message. Here are some additional topics that will help you plan, manage, view permissions and more on your survey. Was this article helpful? If so, please let us know at the bottom of this page. If not, let us know what was confusing or missing. If you got here from a search and it wasn't the information you wanted, let us know what you searched for. We'll use your feedback to double-check the steps and update this article.